All-Ireland Camogie Junior D’ Semi Final. All roads lead to St. Cronan’s GAA field Roscrea on Saturday February 17th for the eagerly awaited All Ireland Post Primary Junior D, Camogie Semi -Final. Coláiste Phobal Ros Cré and St. Mary’s College, Clady (Derry) were going into battle, with the winners claiming a place in the All Ireland Final on March 10th. Both schools had everything to play for and a titanic game of Camogie lay ahead. The conditions on the day were good considering the recent weather. Credit must go to Mark McLaughlin and his grounds team for having the field in excellent condition. There was nothing between these two sides from start to finish. Ciara Sammon opened the scoring for Coláiste Phobal Ros Cré with a well taken free. However, St. Mary’s responded well by attacking the Roscrea defence. The pressure was on Roscrea as St. Mary’s won themselves 3 frees, all put between the posts by the excellent Roisin Gallagher. Coláiste Phobal did not panic. Caoimhe Flannery’s work rate kept the ball up with the Roscrea forward line where Fiona Scully found the back of the net. Ciara Sammon and Caoimhe Flannery also added a point each to the board to ensure Coláiste Phobal Ros Cré went in at half time on a score line 1-3 to 5 points. St. Mary’s came out in the second half with determination. Once again, Roisin Gallagher and Maria Mullan were causing problems for Roscrea. They were rewarded with a well taken goal from Bronagh O’ Neill. Roscrea now found themselves trailing by 2 points. However, the ladies from Coláiste Phobal held strong and did not panic. Orlaith Phelan added her name to the board with a well taken point. 1 point now separated the 2 sides. Coláiste Phobal now needed leaders. Step up Jane Cleary from full back! Jane caught the next 3 balls and drove down the field to deliver the ball into the Roscrea forwards. Ciara Sammon found the back of the net. 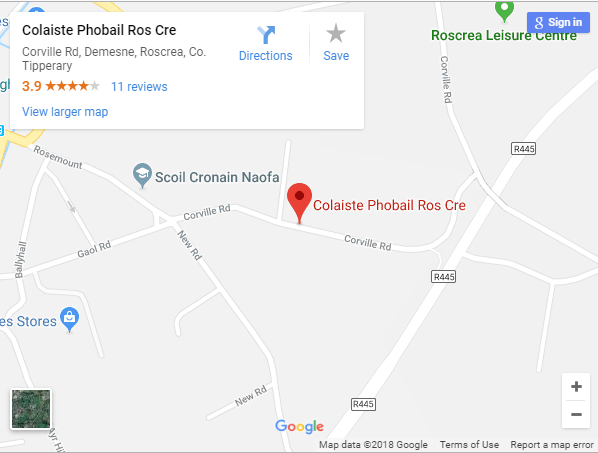 Coláiste Phobal now found themselves in front. Minutes remained on the clock. St Mary’s never took the foot of the pedal and continued to pile the pressure on Roscrea. Again, Roisin Gallagher stepped up and scored a superb point from outfield. One point now separated the teams. Referee Alan Doheny finally blew the whistle to the sheer delight of Colaiste Phobal Roscrea. A one point victory was enough to claim an All Ireland spot for Colaiste Phobal Roscrea. Final Score: Coláiste Phobal Ros Cré 2-4, St Mary’s College Clady 1-6. This was a massive test for Coláiste Phobal Ros Cré and one the girls came through well. We now play Clarin College of Athenry on March 10th in the Junior D’ All-Ireland Final. Sincere thanks to Mark McLoughlin and Roscrea GAA for the use of their facilities. The field and the clubhouse were in excellent condition and are a credit to you all. Massive thanks also to Tara Rowan, Linda Conlon and Caroline Murphy for the refreshments provided before, during and after the match. Also, to the referee, Mr. Alan Doheny and his team of match officials. To Pamela Aiken, Carol Ryan and all who helped at the Gate. To Paula Hendrick, our school secretary, for the match programmes. The girls would really appreciate your support for their project. Voting is simple. Simply go to https://app.junkkouture.com/how-to-vote Find their design ‘Lí Ban’ and vote for them please! You can vote once every 24 hours for a design. Each day you can vote for as many designs as you like. To help promote your favourite design and to earn more votes for them on Super Friday click ‘SHARE’ below your chosen entry. Get your Facebook or Instagram friends voting too. The Voting Gallery will be sorted from the ‘Most to Least’ votes.